Tonight we did a evening craft for the Fourth of July. 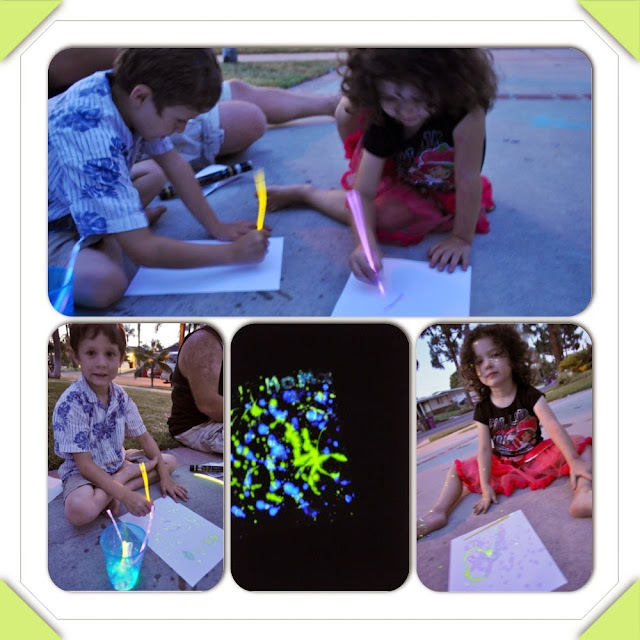 We took glow sticks, cut the ends off and drew 4th of July "fireworks" that glowed in the dark for an hour or two. Make sure you put a fine gauze or stocking over the end that you cut as there is glass inside that you "break" to make them glow. The liquid washes off with soap and the kids had a great time. DISCLAIMER: There are chemicals inside the glow-sticks. DO NOT let children put the sticks/chemicals in their mouths! All crafts should be done with adult supervision. Great fun things for kids.